WSJ: Since it opened its website in July 1995, Amazon.com Inc. has grown from a seller of books into one of the world’s biggest retailers. Its growth has been fueled by a consumer shift to online shopping and Amazon’s willingness to sacrifice profits to expand. 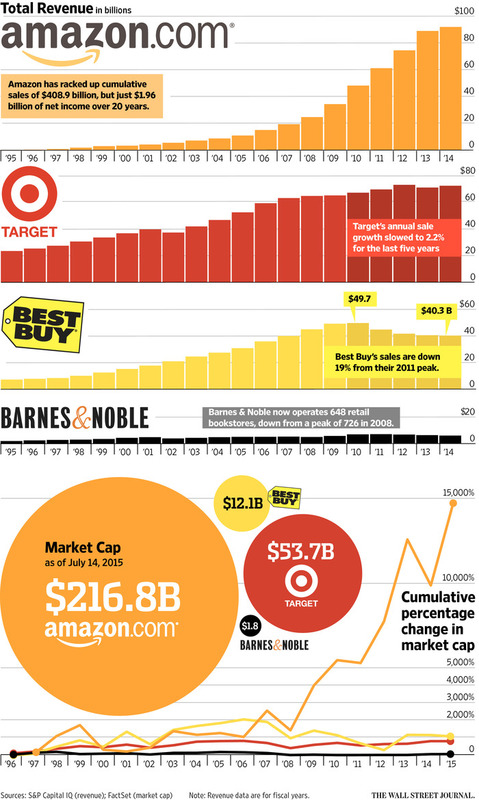 Here’s a look at 20 years of sales for Amazon and 3 close competitors – Target Corp., Best Buy Co. and Barnes & Noble Inc. – and a look how Wall Street has valued those companies.